I love champagne 🙂 No, seriously, I love champagne, especially pink Champagne (oh yes, and frozen margaritas.. but we can talk about that some other time). Last year, my brother, his wife and I killed off a couple of Champagne bottles one night, and one of them had this nice little fancy sleeve on it. So what do I do? 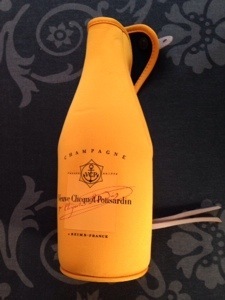 I decide to keep this sleeve, thinking it might be useful for another Champagne bottle… You know, to keep it chilled or protected or something.. I don’t know…. It was obviously some misguided idea I had, that I would tuck some Champagne bottle nicely into this little sleeve, for some reason. It’s not like it’s going to last long enough after it’s opened, to be needing a sleeve to keep it chilled 😉 and should I need something, there is such a thing as a bucket and ice. And it definitely don’t need it for protection. Have you seen how many times they try to break a champagne bottle against a ship sometimes, when they are Christening it? So what was I thinking?